Flexbox is a powerful new way for building layouts that makes some of the most challenging aspects of web development trivial. Nearly all browsers that are used today support it, so it is a good time to see how it can fit in your typical day-to-day frontend work. 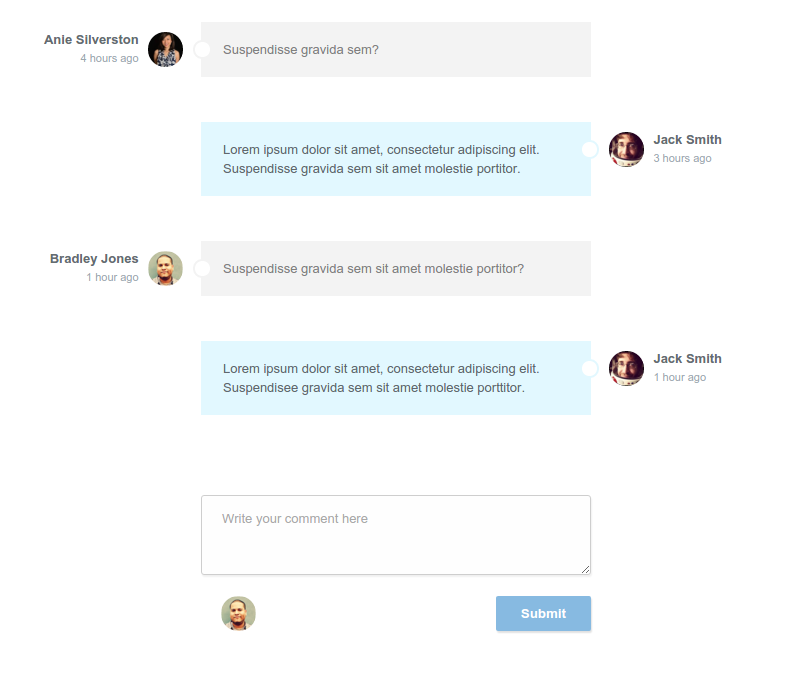 This is why in this quick tutorial we're going to build a comment section using flexbox. We'll take a look at some of the more interesting properties that the flexbox layout mode has to offer and show you how to take full advantage of it. display: flex - This activates the flex layout mode and makes the element's children follow flexbox rules. justify-content - This property defines where the children of a flexbox element will align to (this is similar to text-align, read more here). 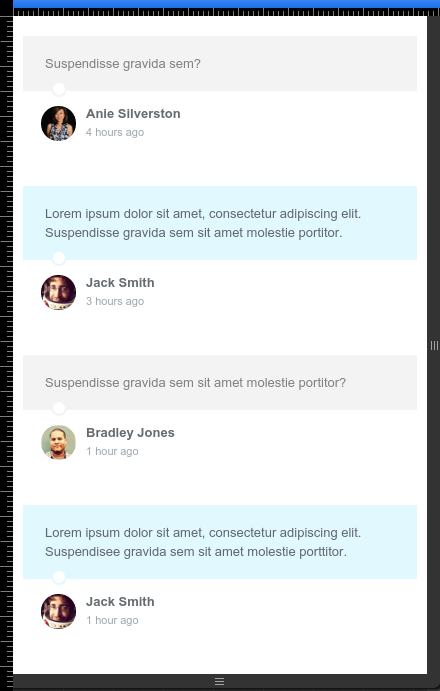 order - Flexbox gives us control on the exact position elements are displayed at. We use this powerful tool in our comment section to switch the text and photo around (find out more here). flex-wrap - Controls the wrapping of the elements within the flex element. We use this to force the avatars to show beneath the comment text on small screens (flex-wrap on MDN). Each comment should have an avatar, name, time and comment body. There should be two comment types - those written by the author (colored in blue and having the avatar on the right) and those written by everyone else. The HTML markup for both types of comments has to be as similar as possible, so it is easy to generate comments through code. The whole thing has to be fully responsive. All of this can be made with a few lines of CSS with flexbox. Let's move on the the code! Our HTML is pretty straightforward. We'll have a list of comments with a basic form for writing new comments at the end. If you look closely at the above code, you'll notice that apart from having different classes, the HTML for the user comments and the author comments are practically the same. All of the stylistic and layout differences between the two, will be handled solely by CSS applied to the .user-comment and .author-comment classes. Here we're going to look at flexbox-related techniques we've used when building the layout. If you want to examine the stylesheet in full detail, download the whole CSS file from the button near the top of the article. First off, we are going to give all comments display: flex, which will enable us to use the flexbox properties on the comments and their child elements. These flex containers span the full width of our comment section and hold the user info, avatar and message. Since we want the comments written by the author to be aligned to the right, we can use the following flex property and align everything towards the end of our container. Now we have the author comment aligned on the right, but we also want to have the elements inside the container in reverse order, so that the message comes first, then the avatar and the info on the far right. To do this we will take advantage of the order property. As you can see, with the help of flexbox, the whole thing couldn't be any easier. Our comment section looks just like we wanted it to. The only thing left to do is make sure that it looks good on smaller devices as well. Since there won't be as much available space on a narrower screen, we'll have to do some rearrangements to the layout and make our content more easily readable. We set up a media query that makes the comment paragraphs expand, taking up the whole width of the container. This will lead to the avatar and user info moving to the next line, since the comments have their flex-wrap property set to wrap. The difference can be spotted right away by comparing this screen capture with the one above. You can also try opening the demo and resizing your browser to watch the comment section adapt accordingly to the size of the window. CSS-Tricks' guide to flexbox - here. An in-depth MDN article - here. A website with easy flexbox solutions for classic CSS problems - here. Hi there, why did you opt for the width property over flex-basis? Hi Morgan, and thanks for the great question! The truth is, it was originally done using flex-basis, but I decided our readers would follow the code more easily, if it was width: 100%;, since that element already had it's size in width and not in any of the flex properties. Flex-basis would do just fine, but isn't necessary in this case (although it's probably a better practice). Hi Danny, it works pretty much the same but seems a bit out of place with all the other flex properties. There's possibly some fallback benefit from using width.